This is the second of three posts. Find the first and the third. West Michigan is blessed with sunsets at the lakeshore. The population here is thick with sunset addicts. Actually, people come from all over to savor those moments when the sun sizzles into the western horizon and splashes its colors across the clouds and sky. These sunset fans will all know the icy blue color the lake often gets in the fading light of the day. On our trip across the lake, as the sun flared orange and red over Lake Michigan, I was surrounded as far as I could see in every direction by that same shimmering, living topaz blue. I really should have woke my crew, Dave, to see the sunset. We had done the first six hours together and were going to split the rest of the night in three hour watches. I had let Dave take the first break. As the sun slid toward the horizon and a premature moon appeared, I reveled in the fact that I was sailing my own boat across Lake Michigan. It was glorious. In all my days and daydreams of sailing, I had longed for sailing beyond the horizon. I wanted to get to where I could not see land – anywhere. Like the sweaty junior high anticipation of actually dancing with a girl, I had no idea what I was doing or if I could pull it off, I just knew that I wanted to more than anything else. The night was a little overcast without many stars and it was getting cold. Dave wasn't due into the cockpit until 10:00p. The lapping waves and gurgle of the boat moving through the water was as relaxing as you might imagine – in the cockpit. When Dave relieved me and I went below to catch a little sleep, I couldn't believe the racket! The water rushing past the hull was deafening. Imagine shrinking yourself to lay inside the drain of your bathtub as it empties. I wasn't sure I could sleep as excited as I was; let alone with all that racket. It hadn't occurred to me that in all my sailing, having never really sailed offshore, I had never been down below underway. But soon I had managed to slip off to sleep anyway. And then the proximity alarm went off. “What is that? !” Dave called from the tiller. One of the reasons I'd been so happy about getting Bella is how well equipped she was. The VHF radio, normally used for talking to other boats, bridge tenders, and marinas, is also equipped with GPS and AIS. The GPS is just like in your car without the streets. It tells me my latitude and longitude, plus which way and how far it is to a waypoint; a destination. The radio also receives AIS signals. Cargo ships, ferries and other commercial vessels are equipped with transponders that broadcast their name, call sign and heading. I had set up the radio to warn us when a big ship was seven minutes away. I just hadn't told my crew. “He's lighting up our sails with a spotlight” Dave said. I poked my head out the companionway and could see running lights of something big behind us. By his green and white lights, I knew he was headed north well behind us to the west. Their amazingly powerful spotlight was just a pinpoint out there, but a big splash of light against Bella's white sails. There were a couple other boats north and east of us, but their lights were far enough away I couldn't make out which way they were headed. The AIS screen wasn't showing anyone on a convergent course. The couple of blips that were there were just skirting the circle, off in other directions. I laid down again but didn't sleep any more. As jazzed as I was just to be sailing that would be enough. About 1:00a, on Wednesday now, we traded spots again and I was back on the tiller where I wanted to be anyway. It had gotten even colder! I had five layers on and draped the wool blanket across my lap when I settled in and got Bella in her groove. The joy soaked back into me and kept me plenty warm. We were slightly north of Muskegon already. Later when the wind shifted, once again in our favor, I slid Bella's bow more toward Muskegon. We hadn't even tacked yet. 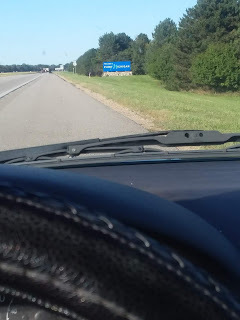 We ran before the wind from Milwaukee, then leaned into a broad reach to the northeast and had just leaned into a reach toward Michigan. The boom hadn't crossed the boat since we were becalmed a mile from Milwaukee. The wind gods were taking good care of us. Its funny how being skipper can change your attitude. The feeling of responsibility weighed on me. I couldn't have made the trip without Dave being along. He was a great help. Though I had considered making the trip alone, I couldn't have pulled it off. But with crew I was also responsible for more than just myself. It was more comforting than worrying, but it was at the forefront of my thoughts. At 4:00a Dave was to come back on watch. He woke up freezing cold and couldn't stop shivering. I was worried he was getting hypothermic. It was cold and damp now, but we hadn't ever closed up the companionway in the fair weather we'd had. As it got colder overnight, the cabin had gotten just as cold as the cockpit. I had him heat up some water on the stove to warm the cabin and told him to stay down there. 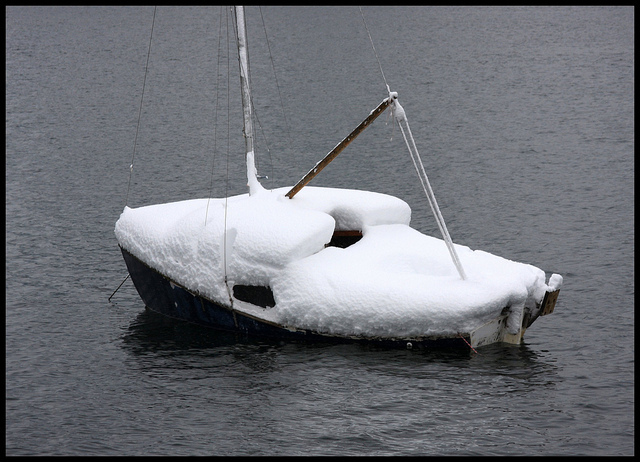 He bundled up and eventually fell back to sleep with a couple drop boards in the companionway and the stove on. Without an engine, any medical issue could have spelled the end of our trip and quite possibly the end of s/v Bella. I was doing fine, until I saw snowflakes. Well ... not quite this much snow. Last image from Flickr. Used without permission. This is the first of three posts, find the second and the third. When we last left our hero, he was trapped by fickle winds and roiling weather in a Milwaukee marina just wishing he could give a friend a daysail. I was stuck at the marina because the starter on s/v Bella would not turn the engine over. Given my time constraints, I decided to cross the lake without an engine. The one good thing about sitting on a boat with no engine wishing for better wind was that in just watching the weather, I had rehearsed several ways of sailing off the dock, out the pass, and into the lake. Dave, my crew for the lake crossing, was as excited as I was to do some serious sailing. When I called to explain my decision to sail without an engine, Dave was still gung-ho. If I had broken the mast off and proposed sailing across the lake with a jib strung sideways on the jagged stump, I'm not so sure that Dave wouldn't have been up for that too. I had been tempted to try to beat Sunday's weather and cross the lake on Saturday, the day after the launch and tow. The weather window, however, was very small. As this crossing was to be my first actual sail on Bella, prudence was the better part of valor. Dave came over on the Lake Express ferry on Monday. The plan was for a Tuesday departure with Wednesday held as an option. As mentioned in the last post McKinley Marina is close to shopping, dining and museums. While we didn't take time for museums, Dave, Nancy and I walked all over, did some provisioning and found a fantastic little Thai Restaurant. Tuesday morning we wandered across the street to Collectivo Coffee for a crew breakfast. After some coffee, essential sailor fuel, Dave and I began our preparations. Nancy wasn't making the trip across as she was driving home, but she stuck around to take pictures and some video. She had also made some guacamole and veggie soup for the crew. Its counter intuitive to land lubber logic but we were leaving in the afternoon in order to sail all night and arrive at the unfamiliar harbor during daylight. The trip was to be around 20 hours, so making the trip in one day's light was just not possible. I had wanted to push off before 4:00p, but rain late in the Muskegon forecast had me move that up to 1:00p. The wind was forecast for northwest backing to northeast on the Wisconsin side with east wind at Muskegon for most of the next day, Wednesday. My float plan was to head northeast until the wind shifted and then southeast into Muskegon. A dog leg for you landlubbing golfers. As we prepared to leave, the wind was 5 to 10 knots slightly north of west. I was glad it was a bit mild for the my first ever sail with Bella. The 100% jib was a little small given the wind speed perhaps but we were being prudent. With a backed jib, we eased off the dock using the spring line to control Bella's first steps before the wind. When the jib came across, we released the spring and were sailing! I cut the corner of the mooring field, passing one boat and several buoys to port with the rest of the basin to starboard. I laid her over into a broad reach and we sheeted the jib to run the channel. It all went like we were a seasoned crew and I loved it. Bella trembled with anticipation and hitched her skirt to jog a little – even under the jib alone. 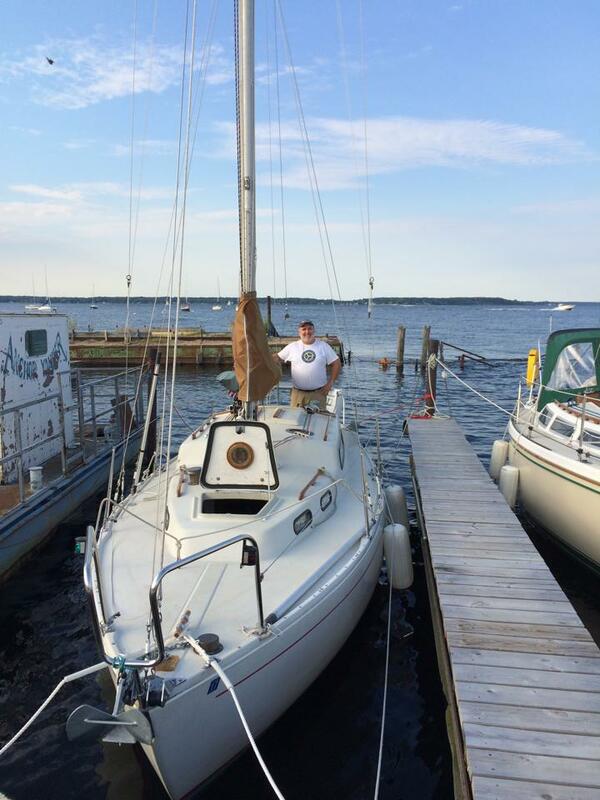 Dave stowed the dock lines and fenders as I sailed her into the area behind the breakwater. 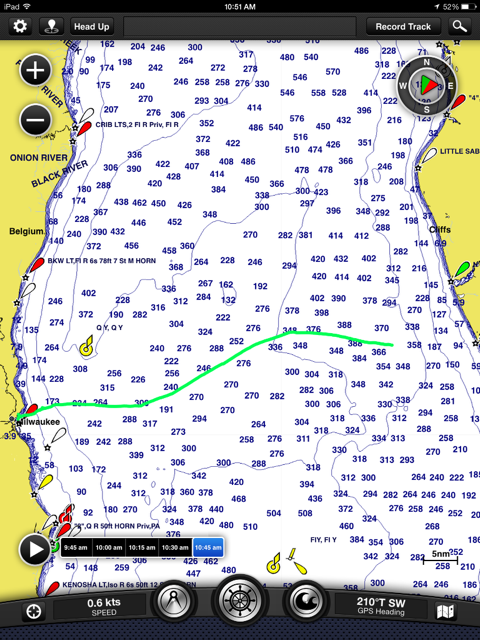 We headed straight south across the wind, tacked back along our track and then entered Lake Michigan through the northern entrance with the wind behind us. Dave, Bella and I fell into a groove and got familiar with each other. We raised the main and she pushed a little harder eastward toward Michigan, her new home. Wind in my hair, my hand on the tiller of a boat shouldered into the waves can only be described as spiritual exaltation. Even without much chop on the lake, Bella galloped to an even rhythm as even and natural as breathing. Sailing is just so natural and positively alluring to me – it is where I belong. Whenever I return to sailing, I am amazed that I had survived however long as I have without it. I know its the same feeling a parched, wilted flower feels the morning after a rain, when she straightens and opens up again, rejoicing with a beaming smile to the sun; for the sun stands in as the whole beloved universe. And then the wind stopped. We were a mile or so off Milwaukee and becalmed. Becalmed is a part of sailing, its OK. Without an engine, however, becalmed is more disconcerting. We were so close, the Milwaukee skyline still loomed above us. Worse yet, but for the lake, we still could have easily walked back from there. I maniacally twiddled with jib sheets and the main. I tacked the boom by hand over my head. 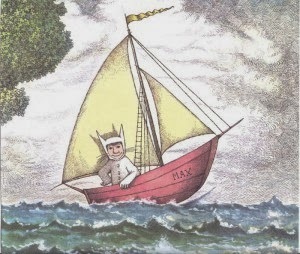 With the lopsided, dilated eyes of a twitching lifeboat survivor, I searched frantically for the slightest puff of wind. Exuding a wisdom beyond his years, Dave calmly said, “Dude, there's no wind. You're not going to accomplish anything but wearing yourself out.” I managed to settle down, anesthetized by the gentle rock of the waves. We munched on guacamole and jicama ... and waited. Eventually, without making us suffer too long, the wind returned. It came back a little south of west, then later backed to the northwest and we went from running to reaching again. I had been very happy with the deal I had got on Bella just as raw equipment. Now I know first hand that she sails like a dream. The sailing was glorious and I am thrilled with my new boat. She has no idea what I have in store for us.